José Segura was not born into the circus: He came from a middle-class family of Alcoy, in the Province of Alicante (southeast of Spain), where his parents ran a delicatessen. They wanted José to be a doctor, but alas, José’s father died unexpectedly, and there was no money left to pay for his studies. One of José’s uncles stepped in&mdash;but he wanted José to enter a seminary and embrace priesthood. This didn’t suit José’s bohemian lifestyle and his taste for pretty girls; he ran away and joined a traveling comedian and puppeteer named Anastasiano, who initiated him to the performing arts and taught him rudiments of acrobatics, juggling and other circus skills. José Segura had found his true calling. He became a circus performer&mdash;a jack-of-all-trades working either as a clown, a perch-pole artist, or a flying-trapeze catcher&mdash;and married Atila Gómez, who came from a circus family. Atila gave him nineteen children&mdash;only seven of whom survived. All the Segura children worked in the small circus show their father had formed, and they originated an exceptionally talented circus dynasty&mdash;producing such remarkable artists as the aerialist [[Carmen del Teide]], the tight-wire somersaulter [[Atilina Segura]], and the bouncing-rope acrobat [[Arturo Segura]], all of whom were Pinito del Oro’s nieces and nephew. José Segura had found his true calling. He became a circus performer&mdash;a jack-of-all-trades working indiscriminately as a clown, a perch-pole artist and a flying-trapeze catcher&mdash;and married Atila Gómez, who came from a circus family. Atila gave him nineteen children&mdash;only seven of whom survived. All the Segura children worked in the small circus show their father had formed, and they originated an exceptionally talented circus dynasty&mdash;producing such remarkable artists as the aerialist [[Carmen del Teide]], the tight-wire somersaulter [[Atilina Segura]], and the bouncing-rope acrobat [[Arturo Segura]], all of whom were Pinito del Oro’s nieces and nephew. Delicate or not, came a time when her father decided that Pinito should contribute to the Segura family show. She was nine years old, and furthermore, she had only limited physical skills. José may have noted, however, that his odd daughter had a good sense of balance: he put her on the tight wireA tight, light metallic cable, placed between two platforms not very far from the ground, on which a wire dancer perform dance steps, and acrobatic exercises such as somersaults. (Also: Low Wire). Pinito hated it. She became very self-conscious and was ashamed to perform in front of an audience: She thought her act was not good. But she was not given a choice. 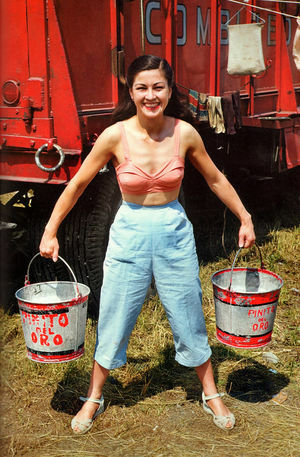 So Pinito del Oro, the circus performer, was born. Not the star aerialistAny acrobat working above the ring on an aerial equipment such as trapeze, Roman Rings, Spanish web, etc., though: The family star aerialistAny acrobat working above the ring on an aerial equipment such as trapeze, Roman Rings, Spanish web, etc., then, was her elder sister, Esther, who had a trapeze act. A few years later, while they were back touring in mainland Spain, one of the circus trucks overturned on a slippery road between Cadiz and Seville, where the Seguras were scheduled to perform at the Feria. Esther was killed in the crash. "The show must go on" may seem a corny cliché, but nowhere does it carry more actuality than in the circus: Pinito had to take her sister’s place as the show aerialistAny acrobat working above the ring on an aerial equipment such as trapeze, Roman Rings, Spanish web, etc.. This was 1943, and she was twelve years old. 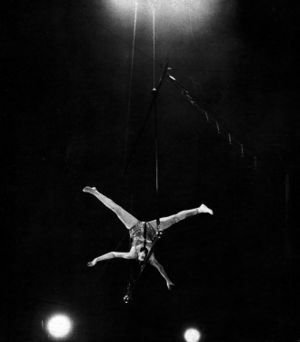 The Washington trapeze(orig. : "trapèze à la Washington" – French) A heavy trapeze with a flat bar, on which an aerialist performs balancing tricks. Originated by the American aerialist H. R. Keyes Washington (1838-1882). 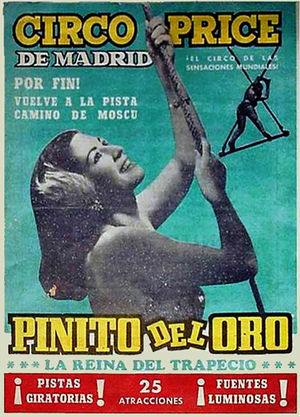 (a trapeze with a heavy, flattened bar on which the artist performs balancing tricks) was an obvious apparatus for Pinito: She was not that strong as an acrobat, but she was a good balancer, and could thus transfer her skills from the tight wireA tight, light metallic cable, placed between two platforms not very far from the ground, on which a wire dancer perform dance steps, and acrobatic exercises such as somersaults. (Also: Low Wire) to the trapeze. 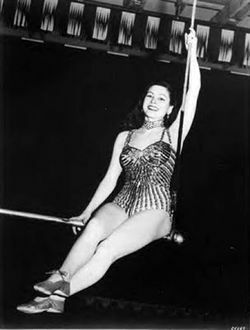 Atila, who didn’t want Pinito to become a circus artist, never saw her daughter perform on the apparatus that would make her famous: Atila Segura suffered from hyperglycemia, and sadly, she died just before Pinito’s debut. And danger there was: She had her first accident in 1948, during a performance in Huelva, in the south of Spain. She fell from her trapeze and suffered a skull fracture that left her eight days in a coma. But she recovered, and went back to perform her act. 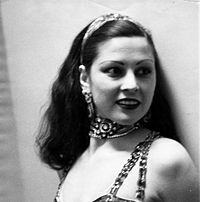 She was by now making a name for herself, and for the 1949 Christmas season, she performed in Valencia with Circo Hermanos Diaz. There she was spotted by one of John Ringling North’s talent scouts, who offered her a contract with Ringling Bros. and Barnum & Bailey Circus, The Greatest Show On Earth.